Every year, April 26 is celebrated as World Intellectual Property Day to promote discussion of the role of intellectual property (IP) in encouraging innovation and creativity. Last year on the occasion of World Intellectual Property Day, I wrote a piece titled ‘ Music & Lyrics’ in which I analysed the overall status of IP in Nepal. At the global juncture, there has been an outcry over IP issues on International Investment Agreement and the last WTO ministerial conference raised concerns about growing plurilateral trading system, which includes a substantial Intellectual Property Chapter. In this note, let’s examine where Nepal stands on IP. Last year Nepal underwent an important development in that it promulgated a constitution, ending a prolonged political transition. The newly drafted constitution has a provision on IP. Article 25 (1) defines property as movable and immovable, including IP. This is interesting as there is no other contemporary constitution that has explicitly included intellectual property within the fundamental rights chapter, although the US constitution has a provision referred to as Patent and Copyright Clause. However, at the global level, scholars are sceptical about including IP under the fundamental rights chapter because of the changing landscape of IP and because treating it as a regulation or property is a matter of debate. Another important development was the establishment of a right to read campaign to create public opinion and pressure the government to ratify and implement the Marrakesh Treaty into National Copyright Law. The main goal of the Marrakesh Treaty is to end ‘book famine’ by mandatory limitations and exception provisions in domestic copyright law for the benefit of the blind, visually impaired and otherwise print disabled. At the international level, there has been a shift in enforcing IP rights through Investor State Dispute Settlement under Investment Agreement. This is a growing concern, which was debated across the globe last year. Moreover, developed countries have realised that negotiations have become very weak at the WTO. As a result, they have felt the need to go beyond the WTO to address their interests and have opted for International Investment Agreement (IIAs) as an important tool. The recently concluded Trans-Pacific Partnership Agreement (TPP) has been an important concern for developing countries. Such an agreement is not in the interest of a developing economy. Many scholars have argued that the last WTO Ministerial Conference may result in the death of the Doha Development Agenda. Furthermore, the developing and Least Developed Countries (LDCs) were disappointed with the recently concluded Ministerial conference. Even though the conference adopted the ‘Nairobi Package’ including Ministerial Declaration outlining the package and the future of the WTO, it failed to reaffirm the ‘Doha Development Agenda’, which is the biggest concern for the developing countries. In other words, it opens a door for the wider acceptance of agreements on investment and trade such as the TPP and Transatlantic Trade and Investment Partnership (TTIP) and acknowledges that the global trade rule would be formulated outside the multilateral trading system. One must understand that IP was never a priority for the government but in light of growing business and development, it cannot remain ignorant of the importance of IP. Also, being a LDC, Nepal must utilise the flexibility under the Trade Related Aspects of Intellectual Property (TRIPS) Agreement and should formulate its unique regime. Moreover, Nepal should focus on ways to encourage its agricultural products and geographical indications would be the best way to promote local heritage globally. Additionally, the geo-climatic condition would ultimately improve rural economy. In the last few years, political instability has discouraged research and development. There is a strong opinion that the country needs to move ahead to achieve economic prosperity after the constitution’s promulgation. Nepal hopes that the bilateral investment promotion and protection agreement (BIPPA) would attract foreign investors. BIPPA includes IP within the definition of investment. Therefore, without a proper IP regime, such an agreement may create additional burden for the state, as IP rights are an integral part of a regulatory system including taxes, investment, regulations, trade policies, etc. 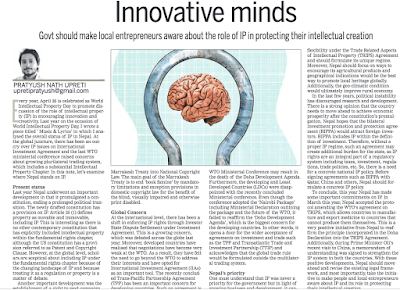 So, there is a need for a concrete national IP policy. Before signing agreements such as BIPPA with Qatar, China and others, Nepal should formulate a concrete IP policy. To conclude, this year Nepal has made some important commitments on IP. In March this year, Nepal accepted the protocol amending the WTO’s agreement on TRIPS, which allows countries to manufacture and export medicine to countries that cannot produce them themselves. This is a very positive initiative from Nepal to reaffirm the principle incorporated in the Doha Declaration into the TRIPS Agreement. Additionally, during Prime Minister Oli’s recent visit to China, a memorandum of understanding was signed to strengthen the IP system in both the countries. 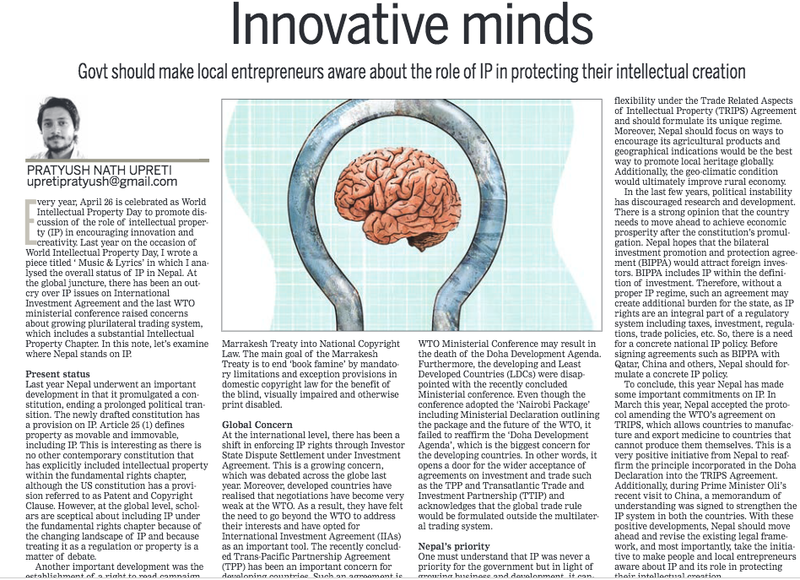 With these positive developments, Nepal should move ahead and revise the existing legal framework, and most importantly, take the initiative to make people and local entrepreneurs aware about IP and its role in protecting their intellectual creation.